The prison strike has ended in seven Georgia prisons, but organizing is ongoing. All 54,000 Georgia inmates work for “Prison Industries” – not a private corporation but the wholly owned subsidiary of the Department of Corrections. In effect, PI employs more workers than Delta Airlines, Coca Cola, Home Depot or any of the largest corporate employers in the state. Inmates are the largest single workforce in Georgia. THEY ARE PAID NO WAGES. To anyone who is familiar with Doug Blackmon’s “Slavery by Another Name,” this forced convict labor system should come as no surprise. It is part of the “New Jim Crow” mass incarceration system that reincarnates the Old Jim Crow in the first half of the 20th century. The demands they presented were for WAGES and WORKING CONDITIONS, which in their case of course includes living conditions. Since the work stoppage involved THOUSANDS OF INMATES, it is probably the largest strike or labor action in Georgia in decades. Moreover, the inmates have firmly taken a stand of interracial solidarity, particularly crucial in Georgia where more than one third of the inmates are white. This action by the inmates was a STRIKE, not a riot or a protest. It was an action by workers TO WITHHOLD THEIR LABOR by refusing to leave their cells. The importance of this interracial strike cannot be overestimated. These men are taking a stand against conditions that violate human rights. Five years ago at a forum on Abu Ghraib held in Atlanta, someone who then worked for the Southern Conference on Human Rights (speaking for herself, not the SCHR) remarked that the methods of Abu Ghraib had their origins in practices common in Southern prisons. If this observation raises skepticism, see the photos in Blackmon’s book showing “stress positions” very similar to those in the photos from Iraq. The inmates’ resistance brings to mind Michelle Alexander’s book “The New Jim Crow,” a book that this summer we studied at UUCA (Unitarian Universalist Congregation of Atlanta). The vast majority of those in prison have been targets of a 30-year policy of white supremacist mass incarceration. Under cover of “the drug war” and mass felony convictions, a bipartisan consensus emerged with the objective result of re-establishing second class citizenship status for most non-whites in the U.S. – the New Jim Crow. Georgia has 54,225 male state prison inmates, according to Georgia Department of Corrections Offender Statistics: 33,689 Black (61.1 percent) and 19,459 white (35.9 percent) with the remaining 4 percent Hispanics, “Indians” and Asians. Inmates’ age distribution is fairly evenly divided, with 2-3 percent of the population in each year of age from 19 to 50 years old. There are 3579 women in Georgia prisons: women are 6.6 percent and men are 93.4 percent of the total. Women are not broken down by race. So far as I know, women inmates are involved in the strike – not yet. Figures compiled by the Sentencing Project show that in 2007 Blacks accounted for 900,000 of the 2.2 million people incarcerated in state prisons, six times the incarceration rate of whites. 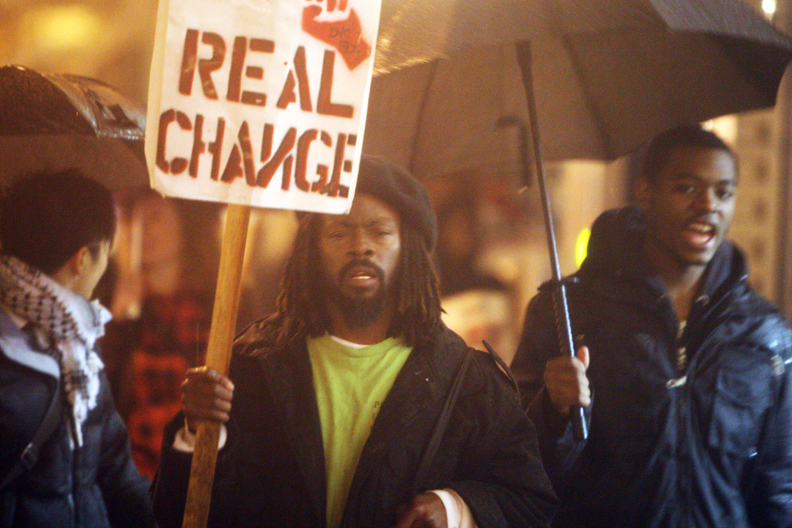 One in six Black men is in the system at any time. Moreover, higher proportions of whites are locked up in local jails (44 percent) than in state prisons (33 percent), and jails tend to be short term sentences. The highest disproportions in prison populations are in Northeastern and Midwestern states. In Alabama, Mississippi and Georgia, as Georgia’s Corrections figures attest, however, the proportion of whites in prison – not jail – is around 33 percent, much higher than in other parts of the U.S. Theodore William Allen, author of “The Invention of the White Race,” points out that where racial inequality has been most extreme, in the South, whites are the worst off. The greater the gap between the white and Black worker, the less able white workers are to defend themselves as workers. The role racial privilege plays in the social control of white working people, as well as Black, suggests why incarceration rates of whites are highest in the Deep South. Working class interracial solidarity anywhere anytime is of historic significance, and according to Bruce Dixon’s report, it is being realized in this movement of inmates. The prison population is of course quintessentially working class, and these workers have launched a strike for wages and improvement of “working conditions.” They have established interracial solidarity. The political consequences of their actions could shift politics in Georgia and far beyond the state; thus the strike deserves solidarity from every corner. “The South, after the war, presented the greatest opportunity for a real national labor movement which the nation ever saw or is likely to see for many decades. Yet the labor movement, with but few exceptions, never realized the situation. It never had the intelligence or knowledge, as a whole, to see in black slavery and Reconstruction, the kernel and meaning of the labor movement in the United States” (W.E.B. DuBois “Black Reconstruction” c. 1935; Atheneum edition 1962 p. 353 Ch. IX “The Price of Disaster”). Although there have been inquiries from my friends around the country and demonstrations in several cities, so far white progressives in Atlanta and Georgia have taken few steps to support this strike. If we continue to ignore the “kernel and meaning” of the progressive movement in our own backyard, we risk losing any relevancy we might have. Especially egregious is the loss of opportunity to support a movement based on working class interracial solidarity. The political consequences of their actions could shift politics in Georgia and far beyond the state; thus the strike deserves solidarity from every corner. Cell phone contact has been crucial, but it’s a slender thread. Bootleg phones acquired from the guards can easily be discovered and confiscated, with disciplinary action taken against both sides to prevent recurrence. Inmates need to establish their human right to contact with their families and the rest of the outside world. David Slavin is an adjunct professor at Emory University in Atlanta. He can be reached at dhslavi@emory.edu. The next meeting of Bay Area for Prisoners’ Rights to discuss upcoming action and an educational campaign is this Friday, Jan. 21, 6 p.m., at the PARC office, 387 17th St., Oakland, right by 19th and Broadway BART. The call-in campaign Jan. 18 was a huge success. A couple dozen people managed to call Georgia Gov. Nathan Deal’s office every 10 minutes throughout the entire day – thoroughly disrupting business as usual. 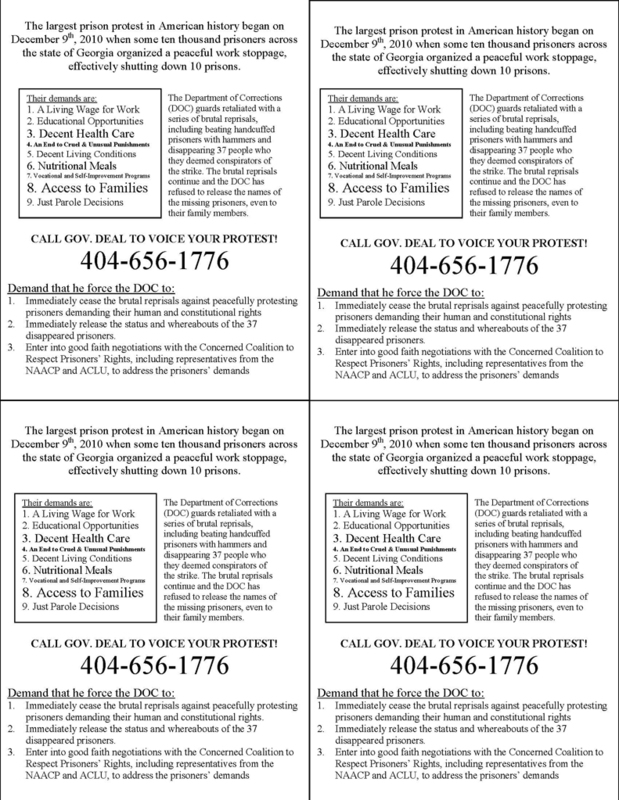 The fact is, the governor has the power to force the DOC to move, and even though he’s beholden to corporate interests, the prison guard union and his constituency – conservative voters in Georgia – we can let him as well as all his secretaries and interns know that people all over the country are paying attention. We’ve decided to continue the campaign and collaborate with other supporters nationwide until the Georgia governor responds to the immediate demands. Here are links to the Google docs for the next several days. Please take a minute to sign up for one or two calls and read the instructions below. Sign up, set an alarm on your phone and make the call. It’s actually been a lot of fun! During the Jan. 18 call-in, the operators and secretaries claimed that they didn’t know anything about abuse or missing prisoners. This is because they have received misinformation from the Georgia Department of Corrections (DOC). The DOC has already admitted, during a meeting with the Concerned Coalition to Respect Prisoners’ Rights on Dec. 18, to having transferred 37 prisoners whom they deemed conspirators of the strike. Despite agreeing to release the information over a month ago and despite several requests from the coalition, both to the governor and the DOC, they have yet to release the status and whereabouts of these prisoners. Call (404) 656-1776; if the line is busy or she transfers you, call the press office, at (404) 651-7782. When calling, speak candidly with the operator. These people are in the same office as the governor and see him on a semi-regular basis. Tell them that you do not want to be transferred to the DOC – they’ve proven to provide false information even to family members – nor to leave a message or send a letter. Their office has yet to respond to the letter sent them by the coalition on Jan. 5. The fact is, they are elected representatives, and we are U.S. citizens. They and/or the DOC are in violation of the U.S. Constitution and the Universal Declaration of Human Rights. They HAVE TO TALK TO US. Tell them we will continue to call until the governor: 1) forces the DOC to cease the brutal reprisals, 2) releases the status and whereabouts of the 37 (or more) disappeared prisoners and 3) enters into good faith negotiations with the coalition to address the prisoners’ demands for constitutional and human rights. 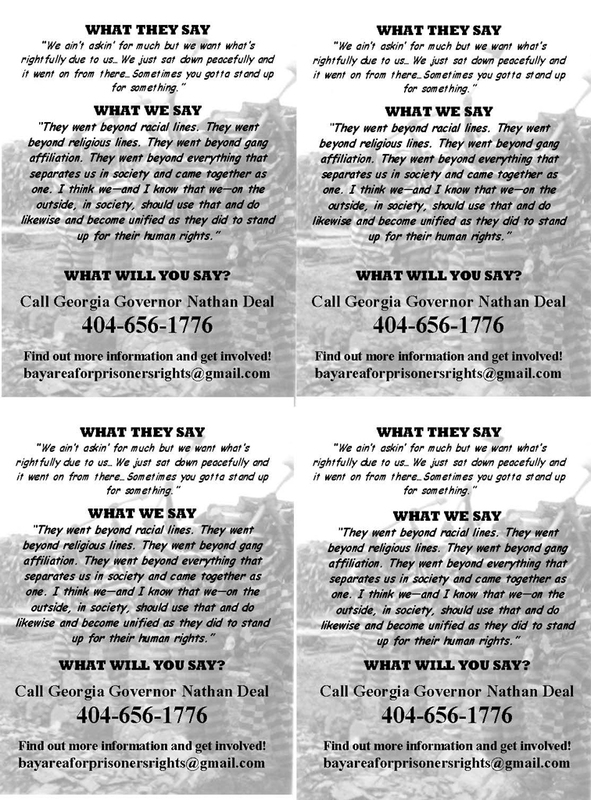 “If Georgia corrections personnel did brutally beat Terrance Dean, transfer him secretly more than a hundred miles from the scene of the crime scene and neglect to inform his family about his injuries or whereabouts, they could be parties to a criminal conspiracy,” writes Hugh Esco of the Georgia Green Party. On Facebook, the event asking people to call the governor is at http://www.facebook.com/event.php?eid=184809271537219. Email Zak Solomon at zsol13@gmail.com and Bay Area for Prisoners Rights at bayareaforprisonersrights@gmail.com. I just made my first cal to Gov & spoke to operator who said he could only give me the DOC ph #, which I said was not helpful as the DOC had 'disappeared' 37 inmates and was not being forthcoming about their whereabouts. I asked to leave a msg with the Gov, explaining my concern about the 37 & expressing my support of the peaceful strike the inmates organized, but sickened by the brutal retaliation when inmates were asking for basic human rights, like to get paid for work done & fair phone access to family. Magnificent information, thankful to the maker. It is puzzled to me now, yet in common, the adequacy and centrality is disturbing. Especially thanks again and good fortunes! The insights you have on this web diary is perfect to the point that I wouldn't perceive any issues with paying to have the ability to get to it. splendid resource, regardless. ought not whimper. tremendously loved.